First introduced in 1953 as the top of the line Chevrolet, the Bel Air went on to reach the pinnacle of timeless design with the legendary 1955 to 1957 model years. 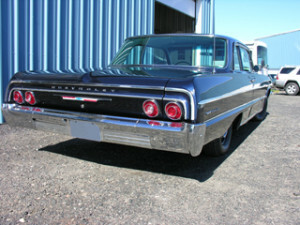 By 1964 the Bel Air was sandwiched between the now high end Impala and the entry level Biscayne. In 1964 General Motors was on top of the world. They had a commanding 48% market share in North America followed by Ford at 27% and Chrysler at 13%. Today GM has plunged to a 17% market share, Ford has dropped to a 16% and Chrysler has slipped to 11%. In 1964 under the Chevrolet banner, GM produced Corvettes, Corvairs, Chevy II Nova’s, Chevelles and the full sized Chevrolets- Bel Air, Biscayne and Impala. Total sales of these 5 models came in at a whopping 1,964,000 units! This was quite a remarkable achievement. The Bel Air line was a smart looking sensible full sized car that was built on a 119 inch wheelbase, 14 inch tires, overall length of 209.9 inches and a weight of about 3,400 lbs. Engine selection ranged from an economical 135HP 6 cylinder to the mighty 425HP 409V8 with two four barrel carburetors. The most popular engine choice beyond the base 6 cylinder engine was the 327 V8 with 250HP. Other engine choices included a 300 and 340HP 327 and two 409’s with 400 and 425HP. A 3 speed manual was standard and could be had with overdrive. A 4 speed manual was optional either with close ratio or wide ratio. The 2 speed Powerglide was the only automatic transmission choice. Positraction could be had in gear ratios from 3.08 to 4.56. Production for the Bel Air model was just over 318,000 units. Biscayne sales were 327,000 units and Impala sales were 874,925 for a grand total of over 1,500,000 units! Sixteen different colours could be had and there were 11 different two tone colour combinations. Body styles included a 2 door sedan, a four door sedan, and a four door station wagon. Base price for a two door sedan started at $2,400. Optional equipment included a chrome roof rack, air conditioning, AM/FM push button radio, rear seat speaker, deluxe floor mats, a hand held spotlight, hood and trunk lid moldings identical to those found on the Impala, seat belts, speed and cruise control, trailer hitch, rear window defroster, bumper guards, padded dash, power brakes, six way power seats, power steering, tachometer, tilt steering, tinted windows, automatic transmission, windshield washers, positraction and an electric clock. 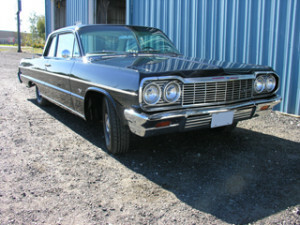 Our featured car was built in early 1964 at the Tarrytown, New York plant. It came equipped for go rather than show and was ordered with the 327 V8 with 300HP and a close ratio 4 speed. A 4.11 positraction rear end was installed along with a factory tachometer, padded dash, tinted windshield and an AM radio. I suppose the padded dash gave the owner a sense of safety and security should things go off the rails! Rounding out the order form was a Daytona Blue exterior complimented by a dark blue metallic interior. True to form the car began its life as a drag racer in upper New York State. The original engine was quickly blown up replaced by a new 327. Headers and a Corvette aluminum intake were added to the replacement package. The car currently has just 22,000 miles on it and has had one high quality repaint. SO WHAT IS IT LIKE TO DRIVE A 1964 BEL AIR? When you first approach the car you notice that it is pretty big by today’s standards. The car has a boxy look to it, the windows are huge and the sheet metal seems to go on forever. The large doors open up easily and there is a metal frame around the door glass. Access to the rear seat is easily accomplished and provides ample room for the biggest teenagers you can find. The front bench seat is a great place to have 3 of you closest friends hang out at the drive in. The trunk is enormous by any standards at about 20 cubic feet and will easily fit 6 sets of golf clubs plus luggage. Slipping into the driver’s seat you immediately notice how soft and cushy the seat is with very little support. Hard cornering will be out of the question in this car unless you can hang on to the steering wheel very tightly. The interior is pleasantly appointed in a no nonsense way with a factory dash mounted tachometer directly in front of you that can’t be missed. After market gauges for oil pressure and temperature have been added to supplement the factory idiot lights. 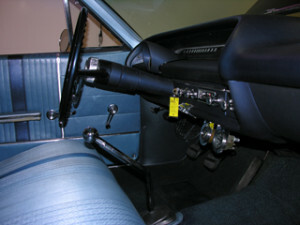 The floor mounted 4 speed shifter is perfectly positioned for precise shifting. The classic 327 engine fires up with ease and the dual low restriction exhaust provides a nice low rumble out the back. Slipping into first gear and engaging the clutch you can instantly feel the torque of the engine. Modern radial tires have replaced the skinny bias ply tires of old giving a much smoother and comfortable ride. Full throttle acceleration must be feathered in to prevent the rear tires from spinning uselessly. With 4.11 gears out back the 5,000 RPM redline comes up very quickly. Highway cruising at 100 KM/PH shows the engine turning at approximately 3,400 RPM. At this rate the 20 U.S gallon fuel tank will not last long. Out on the road you can feel this is a 1960’s era car. The ride is smooth but feels like you are floating down the road. Any type of hard cornering makes you slide from side to side in the seat. The braking power is minimal and brake fade is evident even after a few short stops. The brake pedal is spongy with hard braking taking a long time to bring the car to a standstill. The engine pulls smoothly right up to it’s redline and you can easily spin the tires shifting from first to second under full power. First gear acceleration is brisk owing to the low 4.11 rear end gears. Road tests of the day put zero to 60 times for the 327 300HP engine in the 7.3 second range and the quarter mile took about 15.3 seconds. Top speed was estimated at about 90 mph with the 4.11 gears. If you were lucky enough to own the top dog 409 427HP expect those times to be a half second faster, still not great by today’s standards but very impressive in 1964. Driving around town gets several thumbs up from young and old alike and the car is a pleasure to drive.